"Family Album" is a unique theme compilation of songs about family members -- and all the emotional highs and lows associated with the family unit. A portion of the proceeds from the sale of the release is being donated to several child advocacy organizations around the U.S. 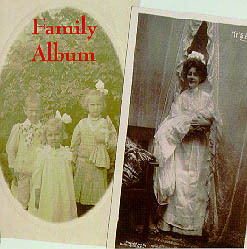 The twelve songs on "Family Album" call to mind so many of the experiences and emotions we can all empathize with -- from the joy of belonging and security (Goodnight New York) to the agony of separation (Rider On An Orphan Train) and mistreatment (Hey Lady) -- from the wistful remembrances of a departed relative (Grandma's White LeBaron) to the memories triggered by an old photograph (The Picture). The songs on this album are portraits of some of those wide-ranging emotions.